‘In passionate pursuit of the best’ is the motto of Ken and Cindy Dye of Homeplace Gardens, located in zone 7 Gastonia, North Carolina. Cindy’s mother and grandmother were both avid gardeners and that helped to encourage her love of all things green and growing. Ken’s mother was a collector of cactus and Cindy often jokes that she married Ken for his mothers greenhouse. Cindy married Ken at the age of twenty and spent fifteen years managing a retail pharmacy. The couple have now been married for 35 years and have two children, both sons and two granddaughters. Her first daylily was gifted to her in 1983, when she was 29, by one of the pharmacists she worked with. She soon joined a local daylily society where she met Van Sellers and Red Nolan. After returning to home after the first meeting she jokingly told Ken that she had joined a ‘Senior Citizen’ club. As with many of us with extensive collections, Cindy started with the cheaper, easily attainable hybrids, filling her new landscape with the myriad of colors available. 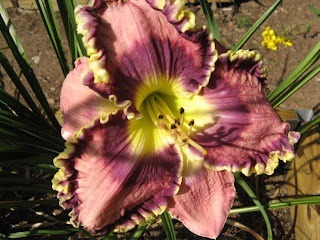 A few years later, she began to dab a bit of pollen, eventually registering her first daylily in 1994. Four years later, in 1998, she hosted her first Regional Meeting and a National Convention in 2003. 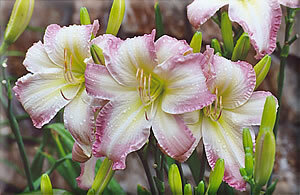 Cindy was eventually joined in hybridizing by Ken in 2000. 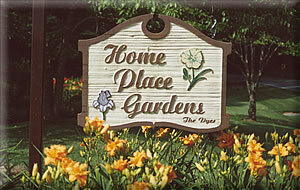 Downsizing is the name of the game at Homeplace these days. At age 55, Cindy feels her energy would be better spent on hybridizing than on regular perennial borders. Only favorite cultivars and those used specifically designated for use in hybridizing are being kept. Less favorite daylilies are being replaced by low maintainence trees, shrubs and hardscaping. 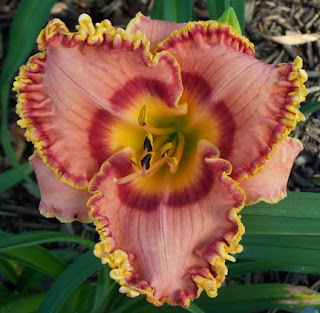 Both Sons used to help in the gardens and showed daylilies in the youth division, until they both grew to old to participate. While they’re both quite knowlegable about plants, they prefer fishing to daylilies. Her granddaughters have taken over the youth showings and have small collections of their own. Their names appear in several of the Dye’s registrations. Ken is the main garden helper these days and is a very good hybridizer himself. Along with daylilies the couple collects evergreen trees, sedums and unusual perennials, pushing the limits of their zone 7 garden by creating microclimates. Container gardens are placed throughout the borders, in direct line with the irrigation systems so they don’t have to be hand watered.